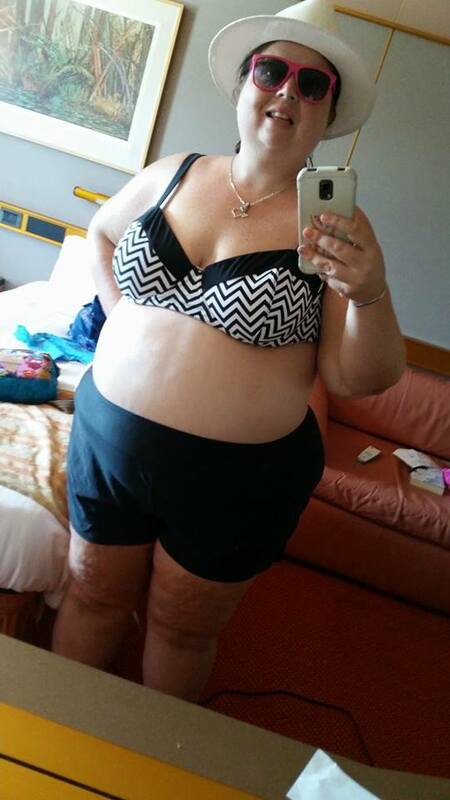 I saw a photo of a typical plus sized lady (not a model) wearing a plus size bikini, which she called “fatkini,” on Huffington Post last year and thought, “I wish I was that daring!” My boudoir photo shoot gave me a big confidence boost and I decided to go ahead and buy one to take on a Mother’s Day cruise last week. I don’t always feel good about myself. Actually, there are still lots of times when I feel unattractive and unworthy. But I’m working on it. I need to be a good example. 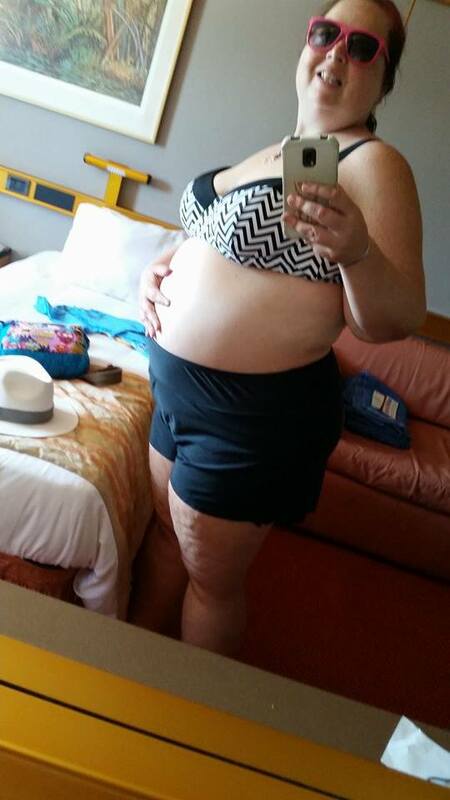 My daughter is 14 and battling body image issues. I’ve taken on a “fake it til you make it” approach with body image. I want to be a positive role model for her, but also want her to know that it’s normal and okay to not feel so great about yourself sometimes. The fatkini was a good chance to demonstrate both sides, starting with a conversation about the name. 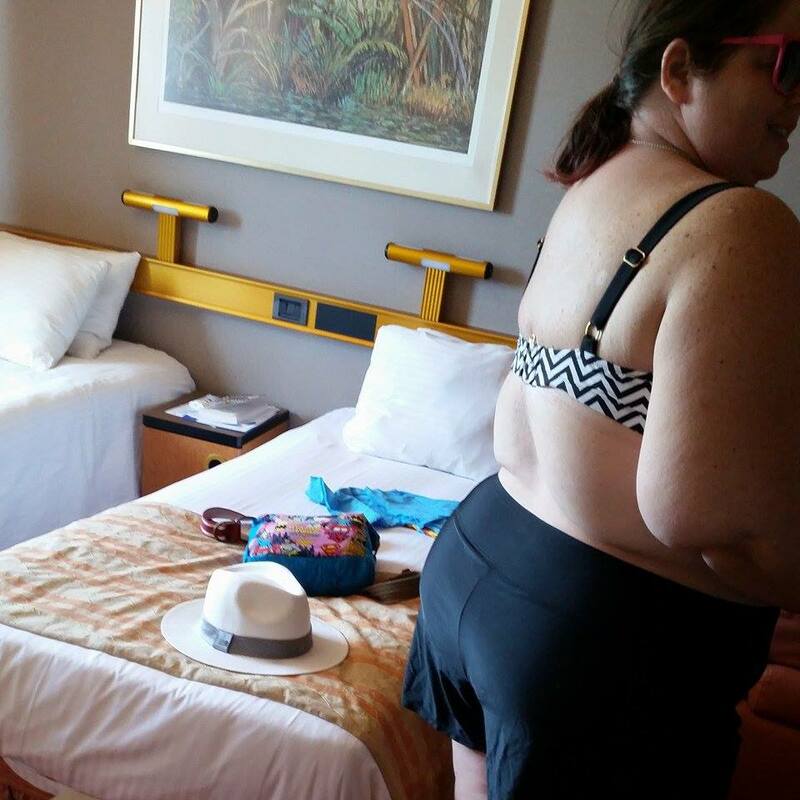 A tw0-piece bathing suit for plus sized ladies that is skimpier than a tankini has been dubbed “fatkini” across the Internet. I asked her what she thought of the name. “It’s kind of funny, but also mean.” I agreed, but don’t really have a problem with the word “fat.” I guess if it’s hurled at you enough, you just accept it as an adjective after awhile. Tall, freckled, brunette, fat. Adjectives. Me. I felt good in the fatkini. 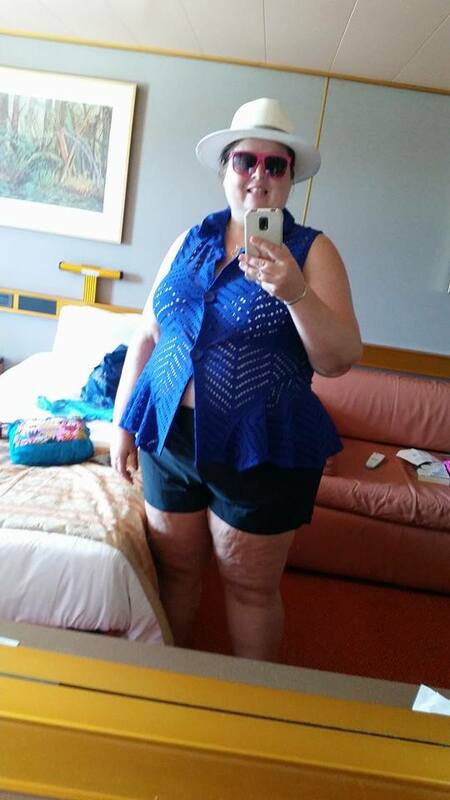 I went with an underwire bikini top and shorts. I thought it was surprisingly flattering. I snapped some selfies and even posted a couple on Instagram. Then it was time to leave the cabin and head down to the cruise ship’s lido deck to try it out poolside. I was excited in the elevator, but then got really nervous when it was time to take off my cover up and hit the pool. It was so crowded. There were no empty lounge chairs, no where to put my stuff. The pools and hot tubs were so filled with people it didn’t look like anyone could move. I threw up an imaginary white flag and went back to the cabin, threw on a maxi dress, grabbed a book and went to one of the lounges to read. I pulled off my dress, set it down on a lounge chair and made my way to the hot tub with my big round white belly glowing in the moonlight. I got in the hot tub with a few other adults and watched “The Other Woman” on the big screen over the pool. A couple of kids popped in and out of the tub. A little girl complimented me on my bathing suit. I kissed her beautiful face and thanked her for seeing that I’m beautiful no matter what size I wear. She doesn’t believe it about herself yet, but hopefully by seeing me do things like pose for boudoir photos and wear fatkinis, it’ll sink in that she’s amazing just the way she is, too. You look beautiful. Confidence is the most attractive “thing” ever. And it is a nice suit, the little girl was right.